I do have an idea to share with all of you today that I have been wanting to work on, but haven’t had the time. So after the kids went to bed I got to work! In June our nephew was baptized, so we all headed down to Highland, UT to attend his baptism. We had such a good time playing and being with family. On Saturday we all went to the baptism. I, unfortunately missed most of it because of my sleepy little lady. But I was able to sneak in for the actual baptism. As we were waiting for my nephew to get dressed and return, a woman (I’m assuming the Primary President) had a cute little bucket filled with pens and cards. Anyone who wanted to write something to my nephew just took a card and then wrote their thoughts, feelings, testimony, or words of advice onto the card. The next day in Primary they would hand the cards to my nephew. I loved the idea, and the cards, so I decided to make some and share them with all of you. I loved this idea because years from now my nephew can look at those cards and read the words from friends and family that wrote to him on his special day. Here is a picture of the cards I came up with. I decided to make one a little more girly and one for boys. I also decided to make one that says ‘B is for baptism’ (like below) and then one that just says ‘Baptism’. At your next baptism just print some out and hand them out. Then on Sunday invite the child up and sing a special song, and then hand them their cards. You could even place them on a ring, tie them with a bow, or put them in a small box. 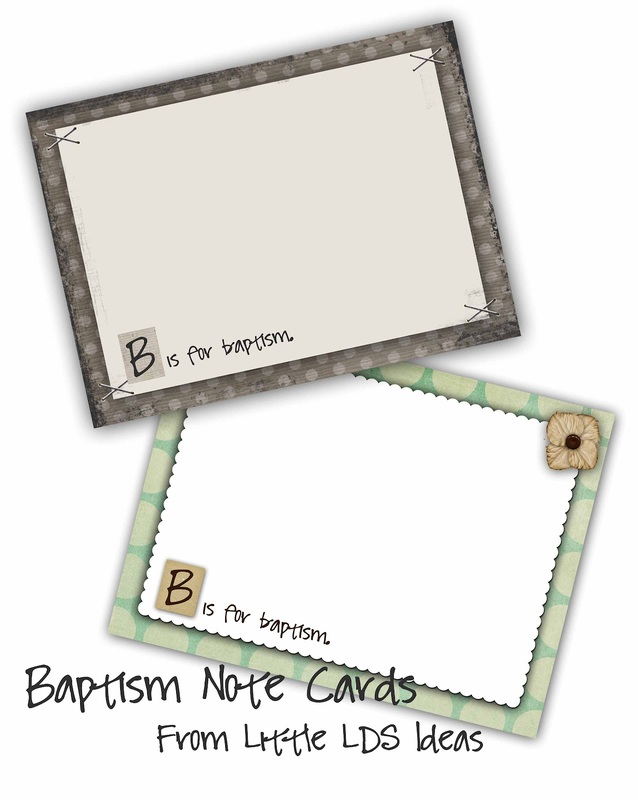 Click Here to view my Baptism Note Cards. Hope you enjoy my Baptism Note Cards. We do this too. So far I just put a little baptism subway art, their name and baptism date on the front cover. I include their program as well. Then I punch holes in the top of the sheets of paper and tie it all together with a ribbon. I am definitely going to start laminating the front and back covers. Such a sweet memory to keep. MY DH is at scout camp this week too!~ My DD was baptized just 3 weeks ago and I wish we had done this! What a great idea! I have done something similar for my two middle children. But I love the cards you designed. Now I can use them for my two youngest boys. I might even attach my cards to the blank side of yours. I am thinking of laminating the cards in someway so that they can’t be written over by accident.